This is an adaptation from my sad and neglected Thrift.City.Life blog post on looking fabulous in thrift store style. I'm a little under the weather and looking a hot mess with a crumpled ball of tissues in my hand right now. I have no fresh photos. I hope you will enjoy the throwbacks! 1. Wear the most stunning shoes you own. Shoes are the base to every outfit. Start off with the most amazing shoe you own and work from there. The right pair of shoes are an instant upgrade to any look. It’s true. Here's a test: drape a sheet over you toga style. Put on your flyest shoe. Go look in the mirror. Looks good, right? 2. 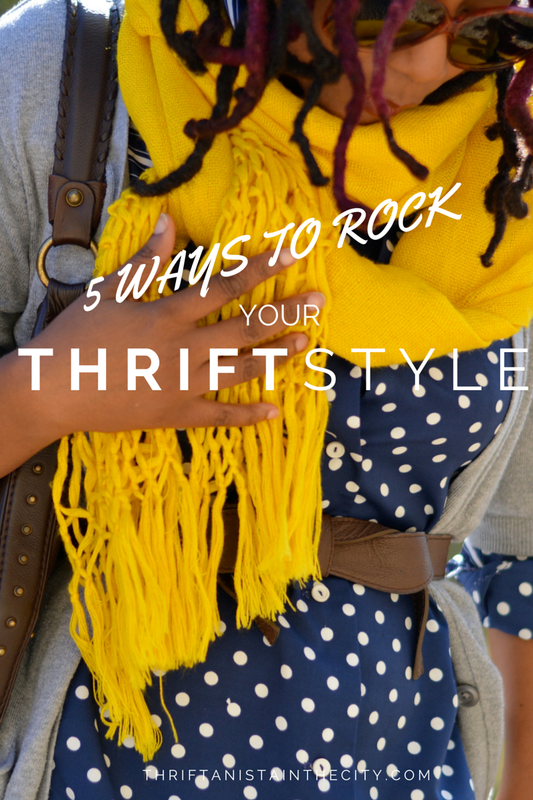 Mix thrift fashion with the latest trends. Throwing in an accessory or two from thrift shops can punch up your look and set you apart from the 479,938 other people who bought the exact same piece. Add an 80s stretchy belt to your waist or a fabulous 60s rhinestone brooch to your top. 4. Mix decades. In order to avoid looking like you’re wearing a costume, break up the years. Pick different decades if you're going to wear vintage from head to toe. Wear vintage on top and current fashion on bottom. If you're wearing a vintage dress keep your accessories current. There are a lot of ways to break it up so that you don't look like you came straight out of a particular time period. 5. Be confident. Confidence is key in most situations. It's always in fashion and on trend. Every woman should have it. Trust me. You’ll look fabulous it whatever you wear! You're definitely rockin' it girl. Hope you feel better real soon. I love that Pink shoes.. you are right, I usually start off with my shoes. And that romper.... wow!! Gorgeous. When I thrift vintage, I usually go more for accessories and bags than clothes, it's always easier to mix those in and keep everything looking contemporary! You look really goergeous!! Amazing outfits!! What about following each other with bloglovin and facebook? That outfit in the second pic is everything! That neon skirt is gorgeous. Styled to perfection. Ladies... I just followed you on bloglovin. I agree with all of these! I love vintage clothes but I don't want to look like I'm Betty Draper. (Well, mostly. Haha.) confidence is key, as you said! You look fierce in everything but I particularly adore the neon skirt and the leopard romper. Ahead of settling on your last decision, you are able to nevertheless flip through some modern publications to help keep you up to date on the styles in season. You need to also choose a mode that may suit and flatter your features. Seek out a color that may provide out the best in you. With each one of these assets offered, finding Celebrities Traditional Weddings of your desires just isn't hard.